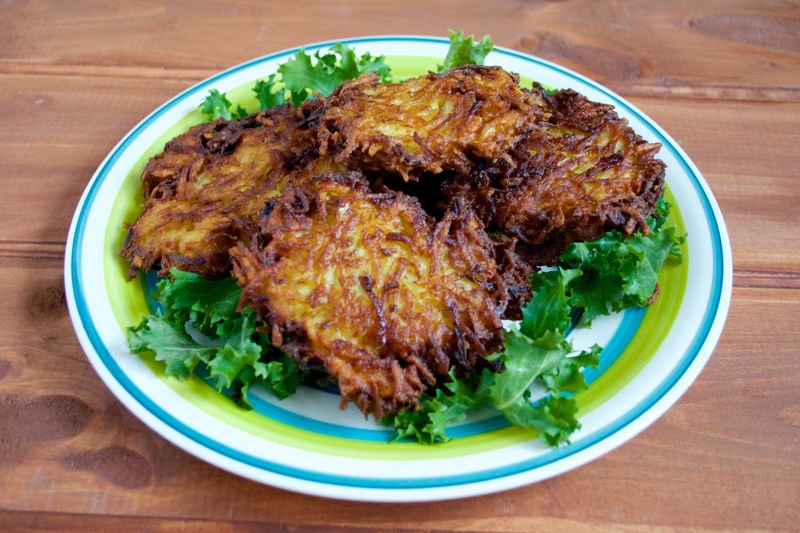 In a Nutshell...: Traditional Potato Latkes for Chanukah! I'd say our gifts were split pretty evenly - we'd often get books, CDs, and small things like funny socks on Chanukah and the bigger gifts like electronics, Barbies, clothes, etc. were saved for Christmas. It was a lot of fun having two opportunities to get presents, though, I have to admit! One of my absolute favorite part of celebrating Chanukah, though? The potato latkes! My sister is the latke queen every year and we've always had the made not-so-from-scratch version. Every year I want to try to make them from scratch entirely and just never got around to it during the crazy weeks leading up to the festivities. 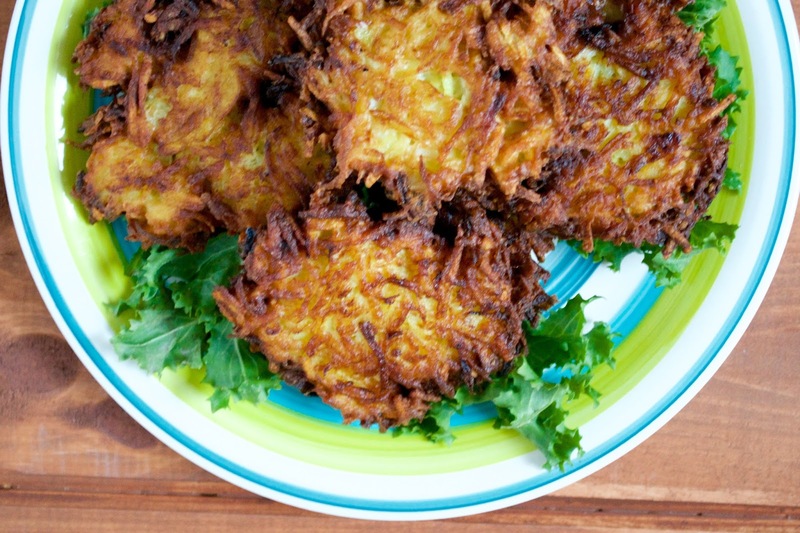 This year, I knew I had to finally give latkes a shot. So I dug up the recipe I had written down ages ago (I wish I could give proper credit - I remember taking notes and directions from two sources!) and decided to give it a whirl since Chanukah started this past Sunday evening! 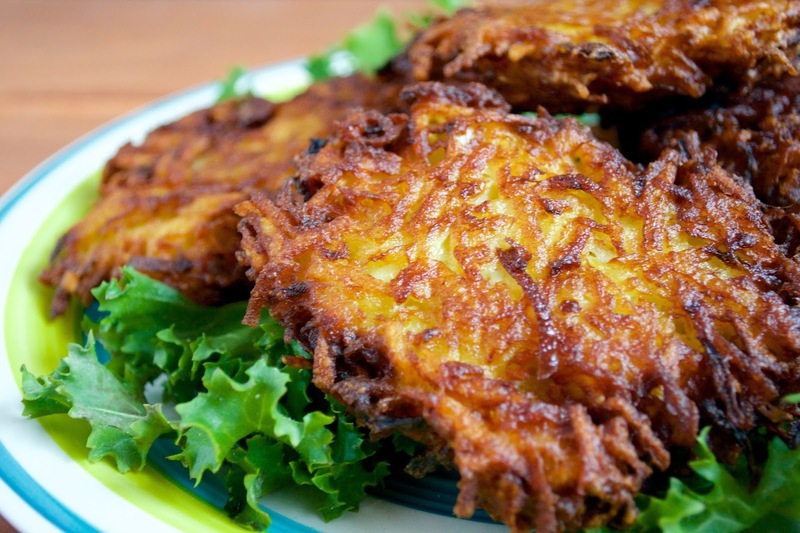 Why did I always think latkes were hard? I swear it is one thing that intimidated me! They're really rather simple and - time saving tip here - even simpler with my food processor at the ready. Oh how I love thee! I got mine for Christmas last year from Cody (he knows me so well!) and have used it more than I anticipated! It grated up my potatoes in a flash! In fact, it was so impressive that Cody came wandering in and totally took over the task. He's a fun stealer, that one. Once the latkes were done, I had two thoughts. One was "dang latkes sure are ugly" and the other was "do I want sour cream or apple sauce on mine?" OH THE HUMANITY! Happy Chanukah, friends, for those who celebrate it! 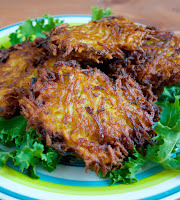 I hope you get to spend it with loved ones and a big plate of crispy golden (albeit ugly) latkes! Peel, wash, and dry your potatoes. Grate the potatoes and squeeze out moisture (you can use cheesecloth or do what I did and squeeze them through a clean dishtowel). In a bowl, combine your grated potatoes with the grated onion, eggs, flour, salt, and pepper. Heat cooking oil in a pan on medium-high heat (you'll want enough oil to cover the bottom of pan, about an inch or two up the side). Form a palm-sized latke out of your potato mixture and gently place into the hot oil. Cook for 7-9 minutes, flipping halfway through, until golden brown*. 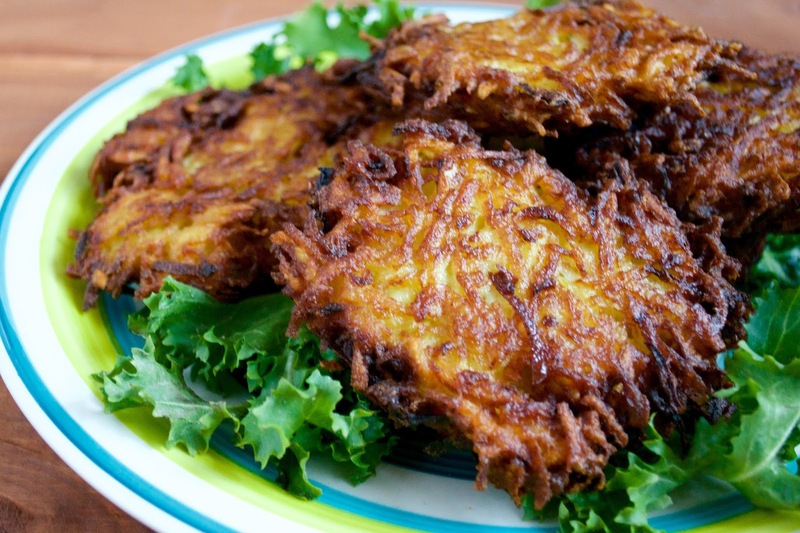 Place cooked latkes onto paper towel to drain excess oil. Serve with apple sauce and or sour cream. *cook times will vary depending on your stove, pan, oil, etc. The best advice I can give is to just watch them closely and once both sides have browned (or darker if you like 'em crispy like we do), they're good to go. How awesome that you were able to experience both holidays growing up! 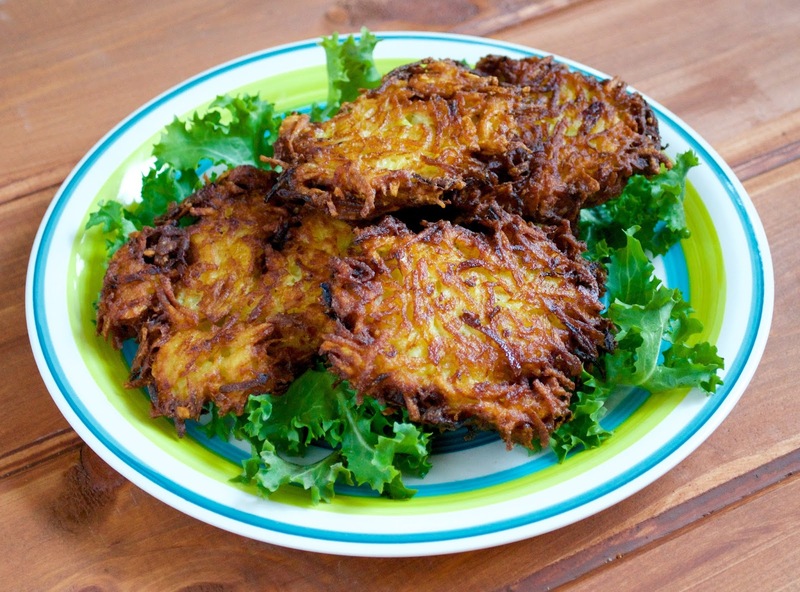 And the latkes sure look yummy to me! I looooove latkes! Interestingly, I also have a Jewish mom and an Irish Catholic dad, so I'm very familiar with the dual holidays and dual foods and whatnot. We loved latkes growing up, and they're still one of my favorite comfort foods now. 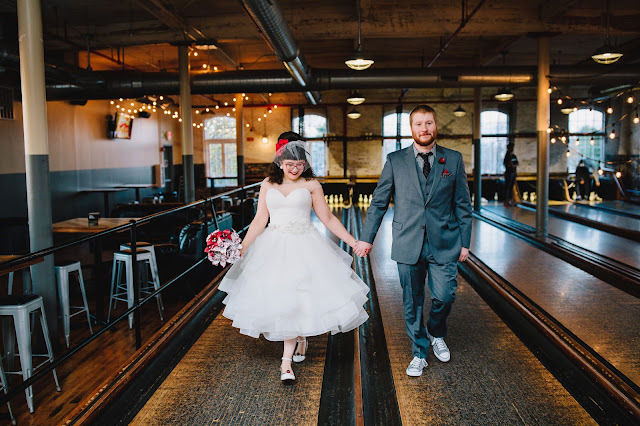 Yours look fab, nicely done!